I don't mean to alarm anyone, but there is a strange white substance covering the ground... Yup. It snowed. Now, there isn't much- yet, I do happen to live in a snow-belt, so more is eminent- but it does seem like winter is here. Snow isn't so bad, if only it wasn't SO cold... You know? 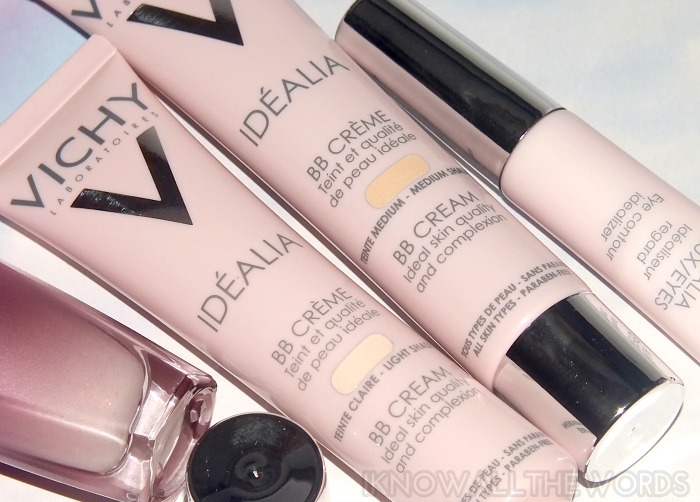 Anyway, onto what you're actually interested in- Vichy Idealia BB Cream and Idealia Eyes Eye Contour Idealizer. Read on! You might know how much I love the Vichy Idéalia Life Serum, so it's easy to assume I was all over the idea of a BB cream too. 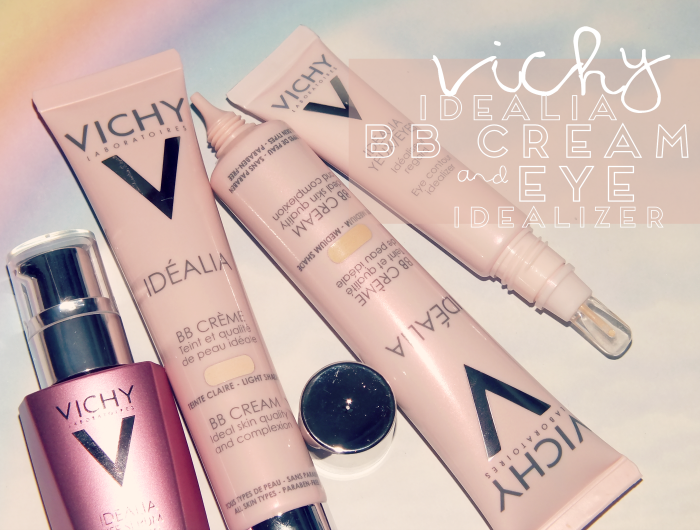 The Vichy Idéalia BB Cream is formulated with an 'Anti-Grey' technology that uses pink corrective mineral pigments to perfect skin- you know, illuminate, correct tone, all that good stuff. That same 'Anti-Grey' technology also works under the surface of skin, thanks to the active ingredient Kombucha. Kombucha works to not only increase radiance, transparency, and clarity of skin from within, but it also reduces grey tones and increases pink tones which in turn leaves skin looking fresh, youthful, and really, who doesn't want that? 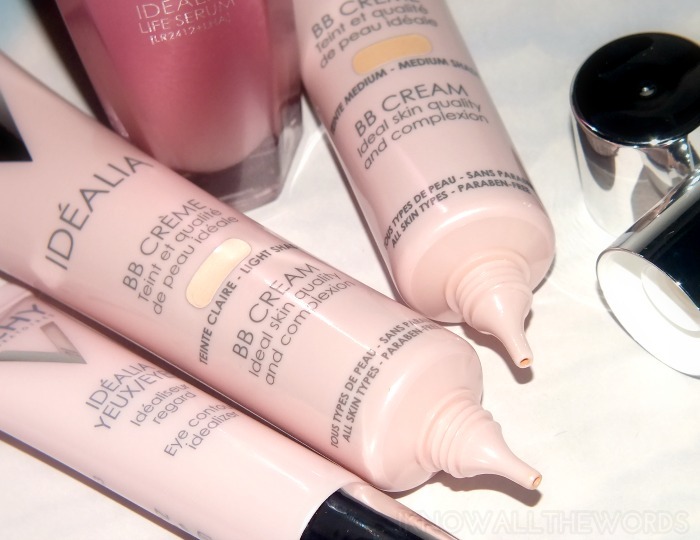 I've used quite a few BB creams- I fall on the like side of the BB spectrum, btw- and have found they tend to fall into two categories. The more skincare type, and the more makeup/foundation type. While Vichy's does give some pigment and coverage, it's more skincare in nature. It does work to even skin tone and blur minor imperfections, but the coverage falls on the lighter side. I love how it illuminates skin, and is quite hydrating, but do need to use concealer or a powder foundation in some areas for that little bit of extra coverage. The finish, however, is amazing- it's natural skin, but better, with a brightened look. Basically, your skin, but so much better. 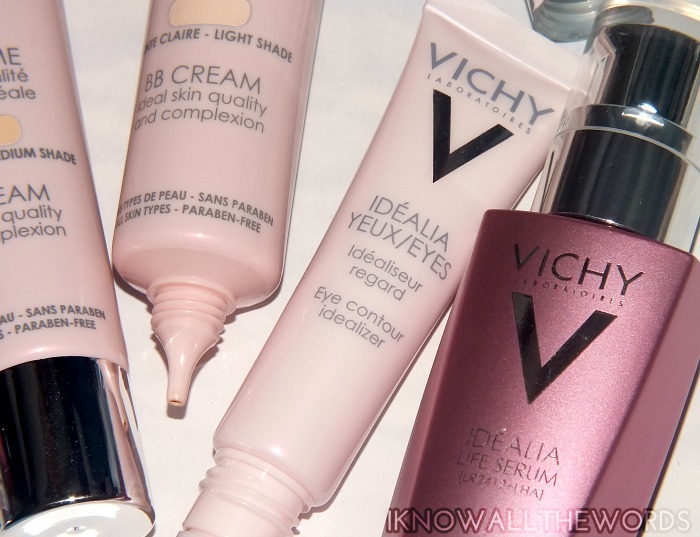 Not to leave the eyes out of the party, there is Vichy Idéalia Eyes Eye Contour Idealizer. So, Eye Contour Idealizer isn't the most usual of names, but this does 'idealize' eyes as it works to smooth fine lines and improve skin texture, illuminate shadows and correct dark circles. It's also formulated with DRM-Bright complex for anti-inflammatory, anti-pigmentation, anti-aging action and caffeine to stimulates decongestion and draining to reduce puffiness. 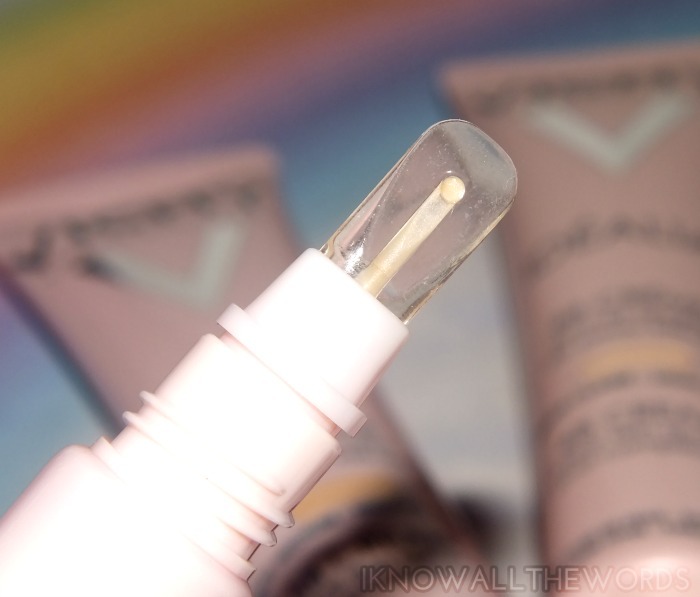 The product dispenses from a tongue like applicator that works to apply the cream to eyes. I then go in with my finger to blend it out. It has the texture of a lotion-like eye cream, and an illuminating, golden shimmer. When you apply it to eyes, it doesn't read as shimmer, it just gives an overall brightened look to skin. It doesn't have coverage, so it's not going to replace a concealer, but it does add that extra 'oomp' and 'I'm awake' look we're all searching for.